Last week I attended the fourth annual Prescription Drug Abuse Summit in Atlanta, Georgia, along with HHS Secretary Sylvia Burwell, NIH Director Francis Collins, CDC Director Tom Frieden, ONDCP Director Michael Botticelli, FDA Acting Commissioner Stephen Ostroff, and former Congressman Patrick Kennedy. 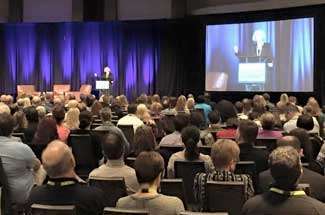 This event, which is the brainchild of Kentucky Congressman and House Appropriations Chairman Hal Rogers, has grown in attendance each year, successfully shining a light on this terrible public health problem in our nation. Rising numbers of opioid prescriptions over the past two decades have facilitated their diversion and misuse and led to the epidemic of fatal opioid overdoses, which only in the past few years has plateaued at around 16,000 deaths per year. At the same time, heroin overdose deaths have increased nearly 4-fold (from around 2,100 a decade ago to around 8,300 in 2013) as abusers of prescription painkillers transition to what has become a cheaper (and even more dangerous) option. It is no longer possible to justify the high numbers of opioid prescriptions by their necessity in treating all forms of pain. Increasing evidence shows long-term opioid treatment may actually worsen some chronic pain conditions, making the need for better understanding opioids’ proper uses as well as their limitations in pain management, and reducing healthcare’s dependency on these drugs, matters of paramount importance. NIDA research is contributing in several ways to tackling the prescription drug abuse problem. We are working to improve the training of physicians by creating Centers of Excellence in pain education to develop continuing medical education modules in pain prescribing and managing prescription-drug-abusing patients. And we continue to work towards developing pain medications with reduced abuse and addiction liability, including abuse-resistant formulations of existing opioids as well as medications that make use of other signaling systems. Through partnerships with pharmaceutical companies, we are helping to design abuse-resistant “prodrug” formulations; and NIDA-funded scientists are also exploring alternative pain-signaling pathways such as the endocannabinoid system, as well as nonpharmacologic strategies, such as transcranial magnetic stimulation, transcranial direct stimulation, and deep brain stimulation. For those who have already developed an addiction to painkillers or who have transitioned to using heroin, we must widen the use of effective treatments and lifesaving tools to prevent death from overdose. I have written before about the importance of expanding the adoption and implementation of effective medication-assisted treatments for opioid addiction, as highlighted in the new HHS initiative. Institutional barriers as well as stigma against maintenance treatment have kept buprenorphine and methadone underused or used ineffectively (e.g., at doses that are too low and/or with arbitrary limitations on the duration of treatment). Similarly the use of Vivitrol (a slow-release formulation of the opioid antagonist naltrexone) for the treatment of opioid addiction is very limited. New developments with healthcare reform should help expand the use of medications for the treatment of opioid-addicted individuals. Along with this, we must widen access to the antagonist drug naloxone that can quickly restore the breathing of people who overdose. NIDA-funded scientists are also actively seeking new approaches to treat opioid and other addictions, such as vaccines to prevent drugs like heroin from entering the brain. The prescription drug problem is now out of the shadows, having grabbed the attention of people both inside and outside of government who are well poised to make a difference. I am confident that the broad spectrum of measures being taken at the federal, state, and local levels to prevent opioid abuse and treat opioid addiction will have a positive effect in reversing this epidemic that has ruined so many American lives. nowhere in this do I hear about how we then get people off of medication assisted treatment OR the very successful non- medication assisted treatment(s) When are we going to decide that not every problem or perceived problem has a medication solution? We use and abuse more medication in this country than anywhere else in the world. There isn't a pill or film for everything!! Good treatment is expensive and not wanting to bear that cost burden drives these theories that a pill (or film) can fix everything. Couple that with our instant solution mentality and more people will die. I'm not sure all the deaths by opioids are not caused by comorbid medical conditions. Even if true,does the Government over react, legislate by over-regulation the use of opioids for patients who function and have some peace(sleep) with their chronic pains?This is a example of harming the painful for mistales caused by diversion or suicides.There's only 5-6 real pain medications available when Clinicians have tried ALL conservative medications and treatments that last a day or less? For the chronic painful,who have passed all drug testing and present with valid medical records as proof of need..do we return to the times when dying a less painful death becomes too much to expect. Where's the balance for US with fair policies and courage from Leaders? I saw Dr. Volkow on C-SPAN and she was the only Govt. Administrator reminding a Congressional Committee that chronic pain is also a legitimate national health issue. States with Intractable Pain Laws are being harmed one Doctor at a time when D.E.A. inteferes with safe treatment plans and tells state medical boards the laws to adopt. This has a "chilling effect" on Clinicians who are compassionate and do the paperwork just to treat one pain patient. Well meaning Clinicians (M.D., Osteopaths) are reluctant to help citizens now who worked and played hard,the American way,that keeps our Nation healthy. Out with the pain pill in with the heroin. Woot! Good job! Nowhere in this does it make any sense that altering a Dr's. way of prescribing medication to a patient who has severe pain. Is going to stop people from taking heroin, no it just makes that persons life a little more difficult in one way or another. Why isn't the use of marijuana allowed? It most certainly would stop at least some of the amount of heroin and pills being taken. Isn't this supposed to be about keeping people alive, after all? Not whether marijuana is 100% safe or not. NIDA. "The 2015 Prescription Drug Abuse Summit." National Institute on Drug Abuse, 17 Apr. 2015, https://www.drugabuse.gov/about-nida/noras-blog/2015/04/2015-prescription-drug-abuse-summit. NIDA. The 2015 Prescription Drug Abuse Summit. National Institute on Drug Abuse website. https://www.drugabuse.gov/about-nida/noras-blog/2015/04/2015-prescription-drug-abuse-summit. April 17, 2015.